On Monday I reviewed Speyburn 10 year old, complementing its uncompromising low-oak grungy style. 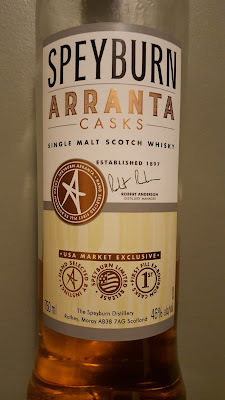 Today, I'm reviewing an NAS big-oak Speyburn called "Arranta Casks". 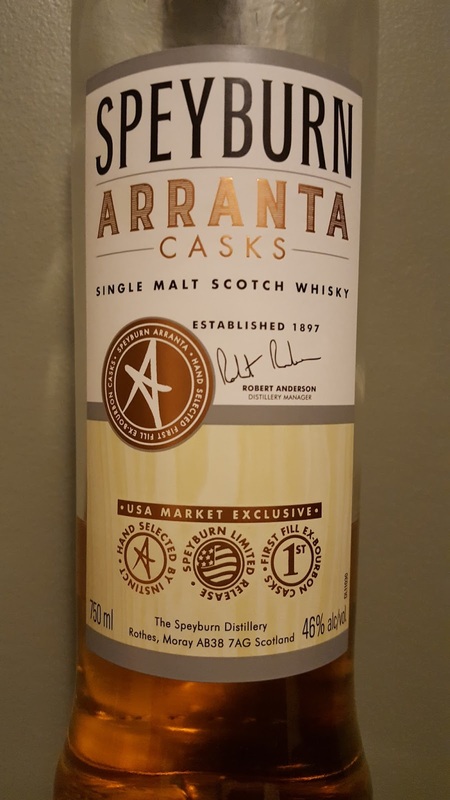 Arranta is "inspired by the Gaelic word meaning 'intrepid and daring'". The whisky is also entirely composed of first-fill bourbon casks and exclusively targets the American market. Kinda seems like it was designed to (try to) capture bourbon fans. In order to get a better perspective of the liquid, I tried this whisky along with the Speyburn 10. Its color is slightly darker than the 10's yellow gold. The nose starts out with lots of oatmeal. Then there's metal, butterscotch, polyester shirt and brown rice. With time it develops notes of cinnamon sugar, nutmeg, florals and hand soap. The palate is sweet and creamy, full of vanilla pudding and caramel. Hints of flowers, heat and soap. There's an undefined bitterness to it. But there are also some raspberry and apricot notes. LOTS of tannins in the very sweet finish. That sweetness steamrolls most other notes, though there are some vanilla and milky things going on. This was better than I'd expected, but still falls short of the 10. The quirky spirit and rich oak make for an awkward partnership. The vanilla and wood spices are present, but either override the Speyburn part or exist separately. Still, it's far from boring and not as much of a mess as Diageo's current woody NAS insults. It's worth a try at a bar, if you can find one that stocks Arranta.